Challenge students to complete one act of kindness a day until they’ve checked off each idea. Give students a blank bingo sheet and ask them to fill in each box with one of the acts of kindness listed above. Then see how long it takes to get a blackout bingo. Print off the list and cut out each idea. Students then randomly draw and perform an act of kindness. Once they complete a kind act, they can staple the paper to a kindness bulletin board. Wanna remind your students to be kind? Be sure to download the free set of posters I shared with you a few weeks ago. 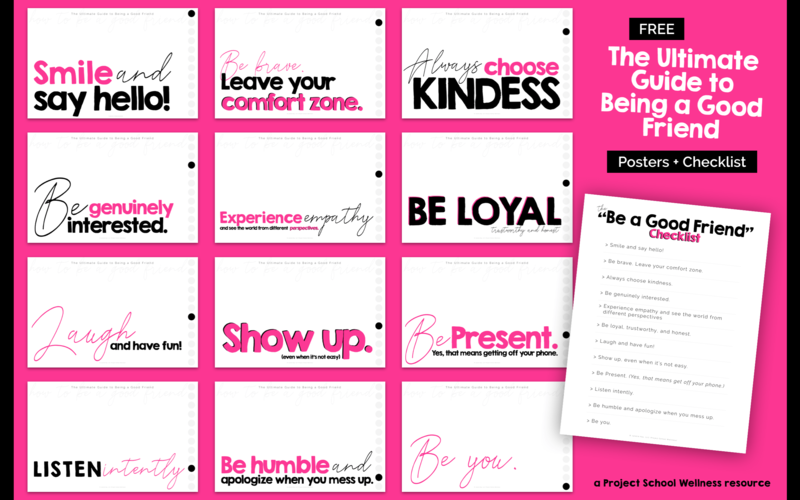 This freebie comes with 12 posters each featuring a different way to be a good friend. Be sure to tune into the next few posts as we talk about middle school + mental health.